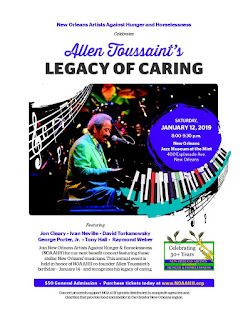 Allen Touissant was one of the founders of New Orleans Artists Against Hunger and Homelessness, so it's very fitting that the organization's annual fundraiser is entitled Allen Toussaint's Legacy of Caring in honor of the great New Orleans musician. The event is scheduled for Saturday, January 12, at the New Orleans Jazz Museum at the Mint, 400 Esplanade Ave., 8:00-9:30 p.m. Check out this five-minute (actually 5:27) video below to hear a song depicting the history and mission of NOAHH, including the role of Toussaint and Aaron Neville in helping create the organization to raise funds for programs that help address hunger and homelessness in New Orleans. This year's fundraiser features Jon Cleary, Ivan Neville, David Torkanowsky, George Porter Jr., Tony Hall and Raymond Weber (click on the links to see YouTube or Vimeo videos on each of the artists). Tickets for the event are only $50 and available here.